Moroccan coral is also known as bryzoan coral. It is a natural stone with interesting black and white markings including spots and lines. I thought this one deserved a modern setting in solid sterling silver with some 14K gold accents in the 4 balls (3 at the top and 1 at the bottom). The pendant looks far better on than in the photos. The bail is large enough to fit a wide omega or cord and is 4mm wide. The back of the pendant is solid sterling silver and stamped 'sterling'. The setting was hand fabricated in my studio and the last photo shows it prior to final polishing and setting the stone. The pendant measures just about 2 inches long. modern abstract sterling silver and fancy jasper pendant. 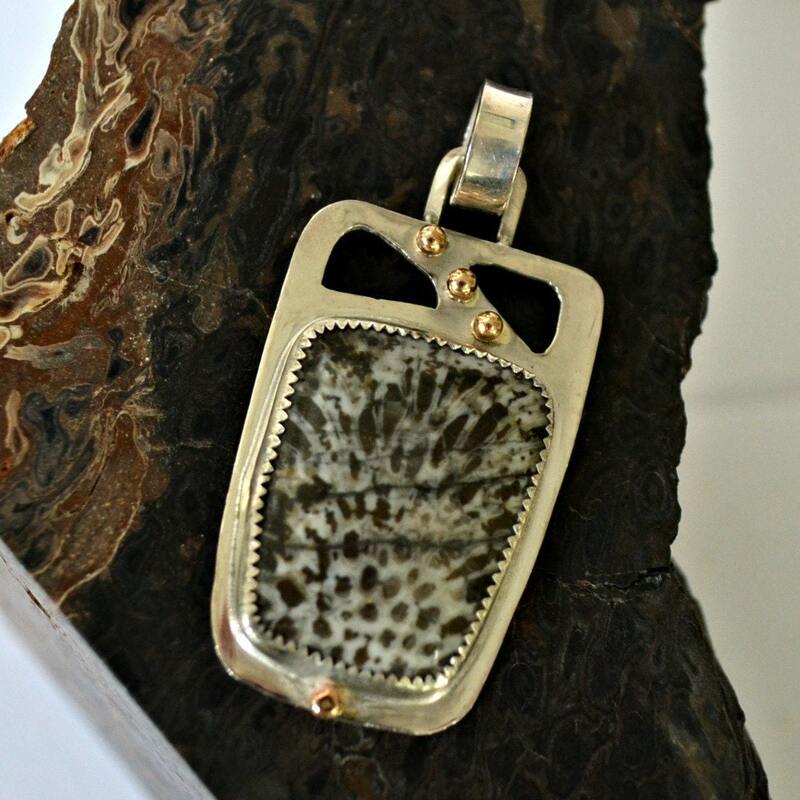 "Abstraction"
sterling silver jasper pendant, petrified palmwood and carnelians. "Egyptian Sunrise"
Genuine Fordite winged heart pendant. "Follow your heart"